If you are drinking beer at the “Ye Olde Trip to Jerusalem”, the oldest pub in England, then why not consume a plate of Fish and Chips to go with it? There is no good answer as to why not, so I took the safe option and did just that. Although it was quite tasty it was a pretty much a tourist version of this dish, judging by the accents around the top room in the pub, I would guess that this place attracts many overseas visitors and I would lay a reasonable bet that they consume a fair amount of fish and chips on their trip to the Trip. 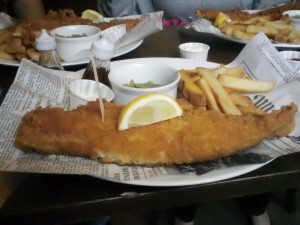 It was good piece of battered haddock, the fish moist and juicy, the batter crispy, the small pot of mushy peas and tartar sauce were good, the chips a bit standard and not too exciting. The good thing was that it was not too large and so I was still able to drink a couple of decent beers to wash it down with. Previous Post Desperately Seeking Hot Dog – "preferably of the cheap and nasty variety"